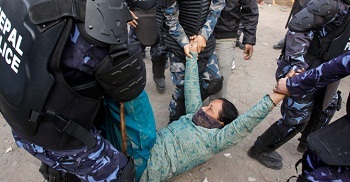 The Nepali people are being bulldozed and teargassed. For living in settlements. And being poor in one of the poorest countries in the world. And in a country that is known for its Maoist revolutionary people and its revolutionary struggle. The media calls them squatters. There is an estimated population of 25,000 people living in various spots along the Bagmati river in Kathmandu. We should also remind readers that these people are being removed by a government led by Baburam Bhattarai, a member of one wing of the UCPN(M). Revolutionary forces within the Maoist party have refused to participate in this government. We will publish all the stories on this we can find. And if readers have info on this please send your comments.